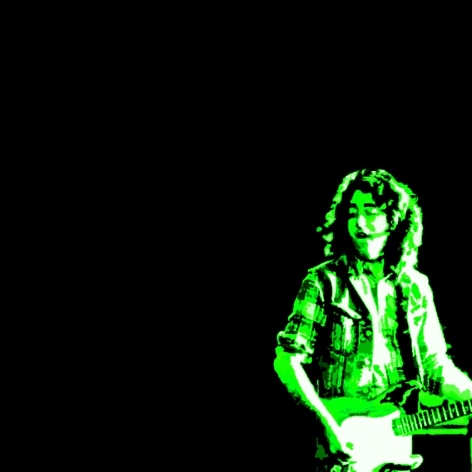 Rory Gallagher – I stand for the blues !! At last, the Irish blues bard, Rory Gallagher, visited Germany and Switzerland with his new group – consisting of drummer Rod de' Ath Morrison, bass player Gerry McAvoy and on keyboards, Lou Martin. This is the first time Rory has brought a key board player to his band. The result of this big tour were sold-out concerts everywhere and an enthusiastic audience. The aftereffects of the unexpected split of Taste seem to be forgotten. Rory Gallagher had brilliant and exciting surprises for both new and old fans with his undeniable style. During almost all of 1973, America kept Rory Gallagher and his band busy and it is a small miracle that the band has time and patience for the old continent. Although the band still seems to be closely linked with the blues, Gallagher is looking for new musical forms of expression – and he does so successfully. Even the great success overseas has not changed the musician or the man, Rory Gallagher, and once again he found the time for an interview with Music Scene. Rory, I had the luck to witness the legendary Taste for a short while. Why did you dissolve Taste at the summit of their success ? I think the album, On The Boards, has separated Taste. The music critics were also not very friendly towards us in those days. On that album you can find a little jazz, a little country, a little blues and a little mainstream. In other words, we were influenced by different styles and up to this day I am convinced it was one of our best albums. Although we were well received in concerts and festivals, we fell apart musically. Every one of us wanted to realize his own ideas in Taste. John Wilson was more attracted to jazz, but I could express myself better in songs such as Gambling Blues. It is obvious we could not use any jazz influences in this song. My colleagues however agreed on their jazz plans and tried to persuade me into their experiment. But I did not want to change our concept and this more or less sealed the fate of Taste. Every night we had the same musical discussions and every concert became a real nightmare for me. As every one of us had a talent of his own it was not difficult to part and try our luck on our own. But if we had been a bit older and wiser – who knows, maybe Taste would still exist. What happened after Taste ? First I returned to Ireland, to occupy myself with my new ideas and to prepare a new band. Luckily, I was soon joined by Wilgar Campbell and Gerry McAvoy, who is still with us today. After our first album, after about six months, we returned to the fans and the concert halls. How did the audience react to the new Rory Gallagher ? During my six months leave from work and worries I could analyze precisely what had gone good and bad in Taste. I looked from a distance at what had happened and found the time to develop a new concept. Although I once again got onto the stage in a three-man band, this was a whole new chapter in my life. I would like to forget Taste, or better: I would like to leave Taste alone forever. That is why I consistently did not play the old Taste hits and I will not get them out again, although they are, for the major part, very good songs and above all my own compositions. Taste was for me simply a period in my development I had to live through and that is it. Sure some of the old Taste fans still called for the well-known old songs, but to my surprise I discovered my audience is tolerant, and was and still is prepared to accept my new development and to listen to me. Today I think my new fans know Sinner Boy or Laundromat better than Sugar Mama or What’s Going On. So it was a smooth transition for my band and my audience. One more time it has been proved that good music and hard work are still appreciated, also when the artist has gone through a transition. But for Rory Gallagher the blues is still very important. Do you have role models in the blues ? I don't really have a role model and I think that is a good thing ! If you cling too much to your idol you will become obsessed by your example and suffer from it. Among the electric guitar players I prefer Buddy Guy and Muddy Waters. I can also warm up to Junior Wells and Jimmy Rodgers. I like all the known Kings, but with these few names my list is by no means complete. I am also interested in the acoustic guitar and in this field I have to mention Blind Boy Fuller, Broonzy and Scrapper Blackwell as well as Willie Johnson. When did you put your four-man band together ? On my album, Blueprint, that I recorded after this year's tour of three months in the United States, we were joined by drummer Rod de'Ath Morrison and piano player Lou Martin. With this expansion I digressed for the first time from the three-man concept. I am happy with this development, because it gives me more new musical opportunities. The separate sound images can be enriched considerably by adding a keyboard instrument. In 1973 we have not been able to hear or see much of Rory Gallagher in Europe, because you were in the United States most of the time. What impressions have you gathered in the new continent ? While I was over there, I also listened to a few bands. Among others, I listened in the Whisky to the band Mose Jones, a group from Atlanta, produced by Al Kooper. They really offered good music and a good atmosphere and in some respects you could compare them to our band. At the same time, we did our gigs in L.A., Steeleye was performing in Ash Grove, so we never had the chance to listen to them. Freddie King, one of my favourites, I also heard in the Whisky, and a few others whose names are less well-known here such as McKenna Mendelssohn, D.C. Bender or King Biscuit Boy. I had a chance to hear in the smaller clubs. About those clubs – where do you see the future of rock music, in clubs or in the big music halls? Our tour with Uriah Heep, in America, will be our last tour of this kind. At the moment we concentrate more on the club scene, and not just in England. Although you play for a smaller audience at such concerts, both you and the audience get more out of it, because you have better contact. If you play for four or even five thousand fans, you cannot reach anyone and what can your music give to the people when they cannot get the message. In the past, we often played in small clubs – it is a pity most of these are closed now – and I am sure that this scene will return once again. Probably the meaning of these clubs will not be the same as ten years ago, but they will become more important once again. All those many fans who cannot get a ticket into, for example, Madison Square Garden will return to the clubs, we saw this development especially in the big American cities such as New York or San Francisco. Nowadays there are many music fans who once again refuse to go for the whole swindle of massive concerts and stinking sold-out halls. However, for artists such as Alice Cooper, who play a different kind of music from us, that is the right place, where they can rage with body and soul during six months of touring. But how long will their fortune and fame last ? My musical achievements should be more than a few pages in a paper. The title 'Rise And Fall of Rory Gallagher' should not be all there is to say about my career ! For theatrical musicians, such as Cooper or Bowie, this would be okay, they do not plan on a long career and the critics are easily seduced. But besides them, many bad musicians and bad actors come to the surface in this wave. Those artists think they have it made with the transvestites look and a bit of jewelry in their hair. Sooner or later they will be eaten alive by the critics. All of this is just a race against the clock, that will announce the end of the band. In one way or another these bands will always end -–all of this is predestined. It almost seems as if you are fighting a small war with the press ? Oh, it is not as bad as that ! In general, I can be satisfied with my critics. I get on the stage every night and I play and play and I give the press many opportunities to get in touch with me. But sometimes it seems as if the critics have to find something negative about you at all costs. Those who don't care about this extravaganza bore the good people of the music press, because they can often only see the difference between Show-Rock and Shock-Rock. But I am sorry to say, I don’t care much about this kind of music. They put a dollar sign on everything, but you cannot compare every artist and his music to other well-known groups from the past or present. Instead of always saying 'He looks like...', these critics should once again occupy themselves with the music of rock, blues etc. But making cheap comparisons is probably easier ? You did not get very good reviews for your album, Blueprint. What do you expect from Tattoo? We have tested every song so many times, until we had the feeling we were in the right mood to record it. I have confidence in this album, and even if it is once again not the one, then I just forget it and make a new record. On Tattoo, you can hear many of my new ideas – if you only want to hear them ! I have also tried to be open towards new elements and I have the feeling this attitude has paid off. I cannot and will not hide the fact that I am still dedicated to the blues. I am not ashamed of that. What would happen, if all black blues musicians would deny their blues ? There are so many fans who have simply kept their feelings for the blues hidden and who defend themselves passionately against suspicions of feelings for the blues. They speak of blues as if it has never existed in their lives and as if they have never profited from it. Surely I also play my own style, but when I interpret songs from the blues or rhythm & blues scene, then I am also a representative of that music and I am proud I can play it. Ten or twenty years from now I will still play the blues. When the so-called progressive turn away from the blues, then I would like to say to them: blues is surely not un-progressive. Surely there are people who can only listen to progressive music with a Wah Wah or a Moog, they reject real blues and rock and roll. But these people have never given it a thought where our progressive music comes from. But what has happened to all those blues bands like Fleetwood Mac ? All these blues bands had their biggest success around 1967. I am sure many people will include me in these blues bands, although I composed 90 per cent of my songs myself – while those groups stuck too much to their examples and influences. I have never tried to copy B.B. King or Otis Rush on stage. There would be nothing wrong in that, but when you hear Rory Gallagher, you can’t say 'Rory and...'. Rory Gallagher, himself, is one of many artists who play the blues. On all my albums or at all my concerts you can sometimes hear a harmony by Broonzy or Muddy Waters. Many songs can be traced back to well-known traditional elements, but others do not fit into such a scheme. Although I was stimulated a lot by the old songs and their performers, I was never dependent on them. But when I hear a modern copy of the old music, I automatically return to the old and original interpreters. It may sound funny, but I could have lived without the old interpreters, but I would not be happy if I did not have them. I like the old blues songs above all and I stand for that. What about your influences ? Well I have also played Irish music at Christmas with my parents when we sing My Laggan Love. Mainly the lyrics of Irish songs have influenced me a lot, because they have a very tragic theme most of the times. Also the use of the acoustic guitar, like the Dubliners do in their concerts, is an influence on me from my cultural background. Now then, where does Rory Gallagher stand in the rock business ? Well thank God I cannot be classified so easily. I don’t have much to do with the big rock business and I am happy that way. I could have more success if I would take more care of my appearance, but I cannot do much with a pop-image. This is also a reason why I did not want to have anything to do with the typical production of singles. But if you saw the reaction of the audience tonight, I guess you could say I am not doing too badly with my style.